so I thought I’d share a couple of really cool paint tips I came across on Pinterest (LOVE that site). Martha’s awesome tip… save your stir stick and write the color name and numbers on the stick. Wipe off your excess paint without making a mess of your can with a rubberband. 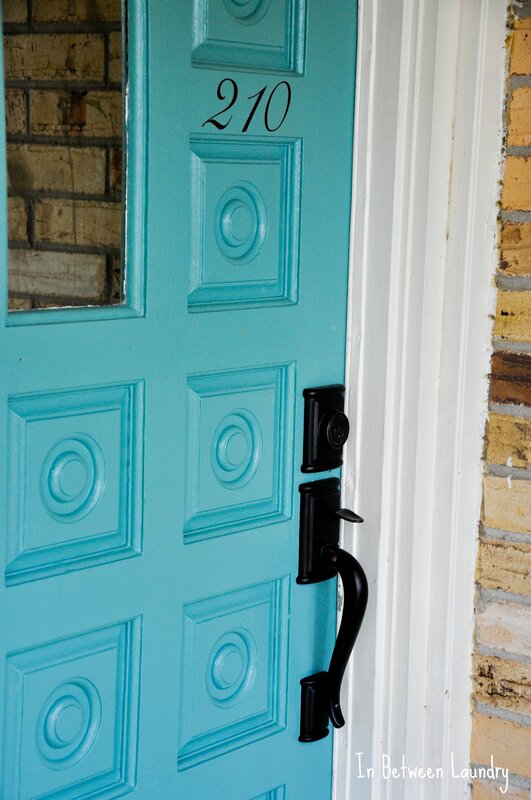 Rub some Vaseline on your door frame so you can close your door while it dries (LOVE this blue door). If you have textured ceilings, use a screwdriver to scrap off some to make it easier to cut in a smooth edge. Use a nail to paint to bottom of your chair legs and to let them dry well. Cook your hardware to easily remove paint form hardware. Aren’t those GREAT! I know I will be using a few of those. So what have you been painting??? Whooops! I linked up twice by mistake. Sorry I'm new at this. Thanks. Thanks for hosting! I know I've linked up here before and I thought I'd followed you. I'm sorry! I've followed you now! Great tips, I always forget about the rubber band one though! These tips are awesome!! Thanks for sharing Maryann!! Thanks for hosting too!